"Oceans Edge" or No. 1 Merlin Bay is one of eight villas at the elegant and private Merlin Bay complex in St James and is one of only two, right at the ocean's edge and the only one with a really private beachfront garden. This split-level townhouse has wonderful beach and sea views from each of the three living levels, as well as a private roof top terrace. Ocean's Edge has a most desirable beach location and is set amidst the lush, tropically landscaped gardens of the Merlin Bay community. Accommodation includes three air-conditioned bedrooms with bathrooms en-suite. 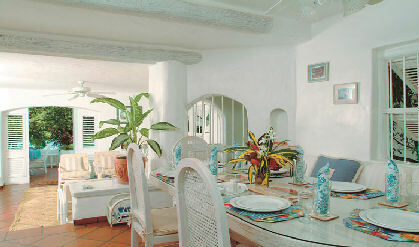 One bedroom is located on the lower level and opens to the plunge pool terrace. The master and third bedrooms are on the upper level. There is a private balcony off the master bedroom, with superb direct ocean views, and stairs from here lead up to the roof top terrace. This villa is equipped with cable TV, VCR and radio/cassette player in the elegant living room. There is a gas outdoor barbeque. Dining may be indoors or alfresco under the stars, on your entirely private garden patio overlooking the beach and sea. Contact us to book this perfectly located Beachfront Villa.